" Charming, Engaging, Sweet and Mystifying....". 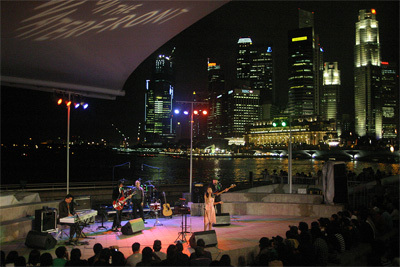 I just happened to love their music so much that I feel the importance of posting some photos from their gig at Esplanade outdoor stage on Friday 27 January 2006. The only difference is that they did not have the brass section like they did last year. However, they managed the situation really well and gave extra "umph" into the music. Mocca has been quite busy lately going on a tour from one Asian city to another (from Pattaya to Okinawa to Kuala Lumpur and Singapore).